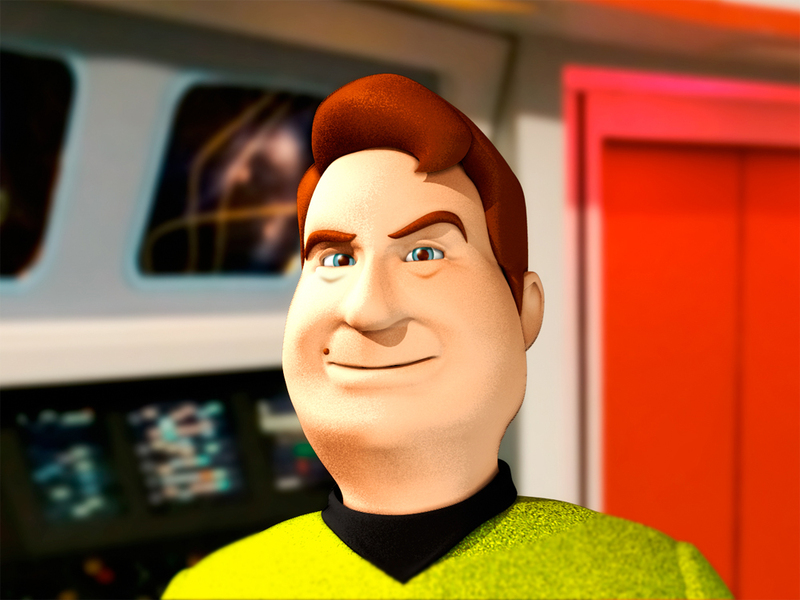 If you haven’t watched Stalled Trek: Amutt Time, click the image above to check it out. It’s MUST SEE fan Trek. Let’s set the Guardian of Whatever to take us all the way back to March 18, 2016 (yes, last month) at 12:30 p.m. Pacific Time. I had just posted the second part of my interview with Mark Largent here on Fan Film Friday. 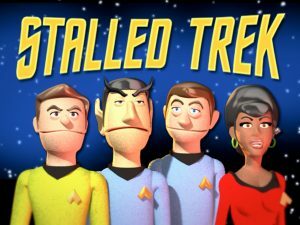 As you might recall if your read the interview, Mark was the creator of Stalled Trek: Amutt Time, an hysterical fan film parody of the TOS episode “Amok Time” that featured computer-animated puppets as the crew and characters. I was just thinking that my next parody should be “Stalled Trek: Prelude to GettingAxe’d” a History Channel-style documentary where Stalledfleet history is interrupted by corporate lawyers putting a circle-c stamp on everything and carting it away, until all that is left is a guy in his underwear sitting on a soundstage floor. I tell you what, if you’re willing to co-write it, I’m game. Well, actually, there’s a bit more to it than that because I actually had no idea whatsoever about how to be a co-writer on this! I’ve never written or even helped to write a fan film script before…let alone a parody. How much would I have to come up with? Where would we even start? Mark loved nearly all of my suggestions, and I loved what he did with them. And that’s the way we kept working together. Within 48 hours, he had uploaded a 7-page first-draft script in PDF format, and I laughed out loud as I read it. The man really is a hilarious writer. Again, I gave him some feedback and ideas, and he laughed just as hard. A few script tweaks later, barely five days after our initial e-mail exchange, the now 8-page script was locked. In the meantime, Mark began modeling some of the puppet heads. His intention was to get this done as quickly as possible because the parody would only be relevant as long as there was still an active lawsuit. 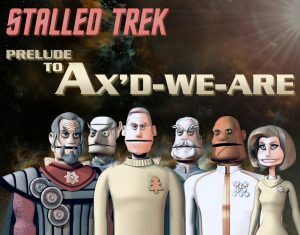 Granted, we both hoped Axanar’s legal troubles would settle quickly and to the mutual benefit of all involved, but if the case resolved itself in April and the parody didn’t come out until July or August, well, it just wouldn’t seem as funny or timely. So we had to get this done at warp speed. And when I say “we”—well—Mark was really the one doing all the work. Now, perhaps Muppet-style puppets just look inherently funny to begin with, but as the screen shots landed in my e-mail box one after the other, I began to get more and more excited. 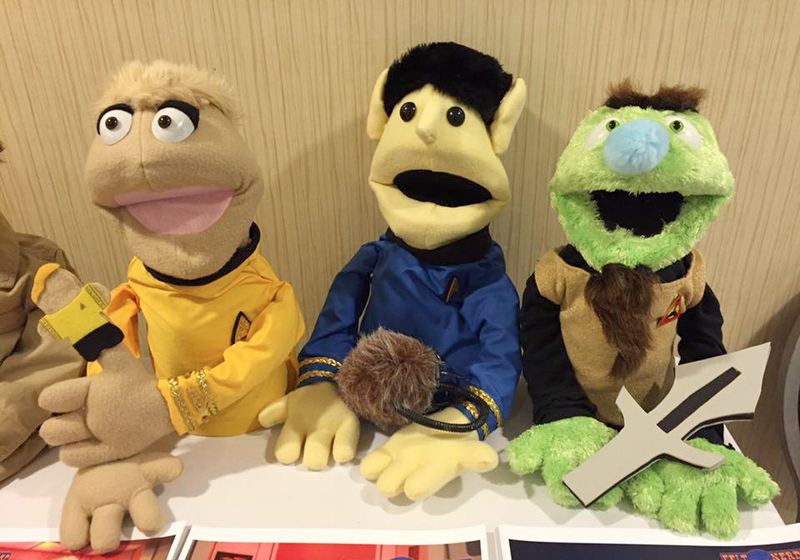 They looked awesome…as if each Axanar character had stepped into a transporter and come out a puppet! The only bit of constructive feedback I had to any of them was when I saw the Travis character (renamed Tropes). The eyebrows weren’t working for me, as JG Hertzler’s eyebrows actually angle down at the outsides, not up. I was hesitant to criticize Mark’s obviously hard work, but he was fine about it. He added a lower outside curve to both of Tropes’ eyebrows and…perfection! With the script done, there seemed to be nothing else for me to do…except for crossing an item off my bucket list: I’ve always wanted to do a voice-over! Back in college, I was a radio disc jockey, but it’s not the same thing. 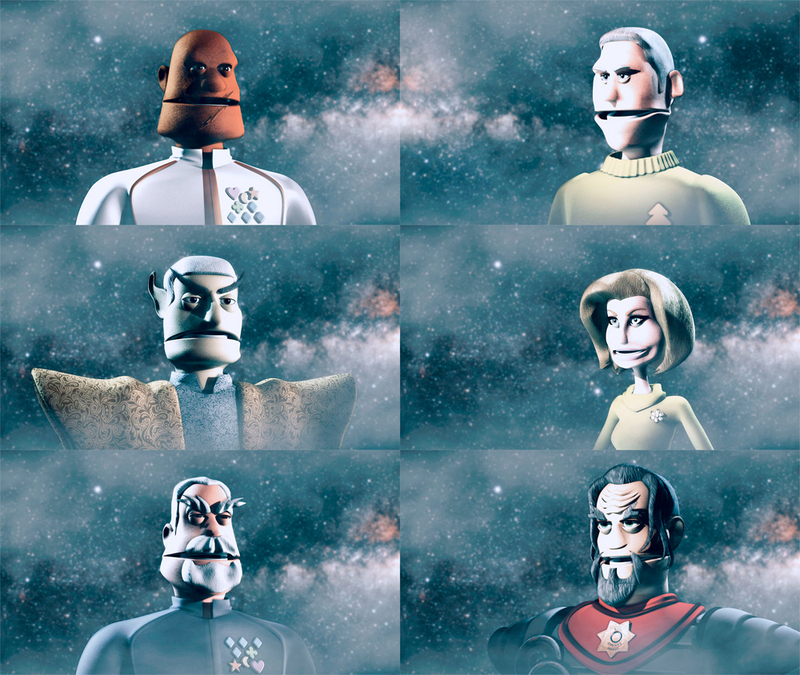 Our little parody animation had eight different characters…certainly there must be room for me to do a voice or two. Mark was completely on board, and we agreed for me to tackle the Soval character (Snowball) and the Klappon Commander Dharn. I sat there at my computer for a couple of hours doing multiple takes of each of their lines. I had a blast! Later, at Mark’s request, I also did the lines for the lawyers. 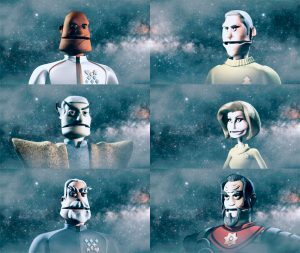 Mark did the narrator’s voice and Admiral Rememberz (Ramirez). His buddy, Mark McCrary, had never forgiven Mark for leaving him out of Amutt Time, so McCrary got to do Tropes…whom I really think wound up with the best lines (a few of them improvised!). A third Mark (Levine) did the voice of Captain Kevlar Vest of Izod…and he sounds amazingly like Alec Peters (at least to my ear). The final character, Captain Salty Axelgrinder, was NOT voiced by an actor named Mark (‘cause we needed a woman), but Mark Largent still found someone whose name starts with an “M”—Michelle R. McAnally—whom mark has known for 25 years. Michelle lives in Scotland, so we can brag that we have an international cast! All of the dialog was recorded—either into iPhones or computer mics—within a week. But we also needed music. Neither Mark nor I are musically inclined, and we didn’t have the funds to bring in even an inexpensive composer. Fortunately, Mark knew of some royally-free music available online from Kevin MacLeod. Kevin’s is an interesting story. Believing that the current U.S. copyrighting system is broken and unfair, Kevin decided to distribute his original music royalty-free through his website. He’s created over 2,000 different compositions that have been used all over Youtube and even in big Hollywood films like Hugo. He’s got 1,800 composer credits listed on IMDb, and he only charges folks $30 for open access to his entire extensive library of music! It seemed somewhat appropriate to use the music of a person who tilts at the windmill of copyright law to score our film that likewise tilts at that same windmill. It still amazes me how quickly it all came together! As the days went on, new bits of animations would get posted to private Youtube pages, and things just got funnier and funnier. I still made myself useful here and there, recording additional dialog as the script evolved, suggesting the occasional tweak, or noticing a few small glitches. And as the film continued to take shape, new jokes kept right on popping into my head even up until the final weekend when I suggested having flashing lights and sirens go off when the Stalledfleet starship crosses into Klappon space. Earlier on, I came up with a logo idea to add to the ones that Mark had designed for the surface of the planet Areyoukiddingus. 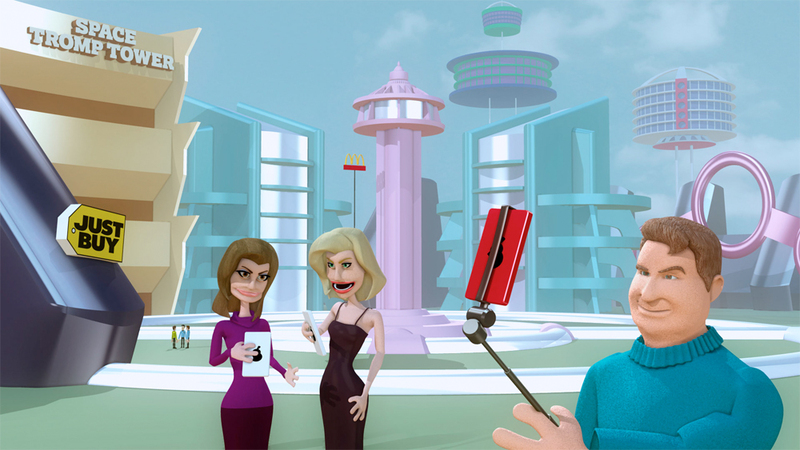 Mark had created an awesome Jetsons-esque space city with a number of parody stores like “Just Buy” and a McDonalds sign with three arches. 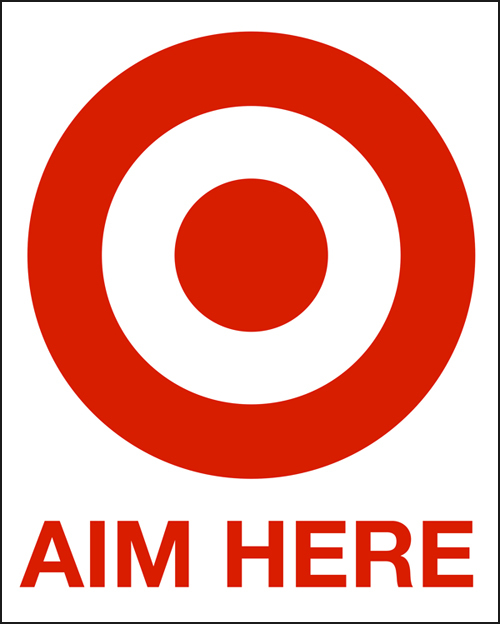 I felt like there needed to be just one more sign somewhere, and I thought of mocking TARGET. So I grabbed the TARGET store logo and inserted the words AIM HERE instead…which would become even more appropriate once the planet gets attacked. I guess Alec doesn’t mind Muppets after all! To be honest, Mark and I were very careful to construct the script in such a way as to not “take sides.” Even though we’re both big Axanar fans and tailored most of the gags to make fun of the iron fist of the studio lawyers descending on this production, the jokes are actually based on the various places where CBS and Paramount believe their intellectual property was violated…at least according to their amended complaint. So for the studio execs, I expect they may watch this (if they even bother to do so) and just cheer on the lawyers. There’s ways for both camps to see this short film as a “win” for their side. 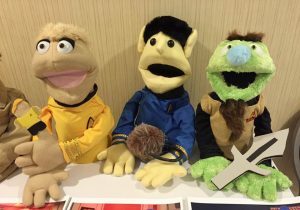 In the end, all we wanted to do was have some fun and give Axanar fans a chuckle. Granted, Mark Largent had to do a ridiculous amount of work in an even more ridiculously short time in order to achieve those goals, but despite the long hours and brain drain, he did admit to having a lot of fun. And he said that having me in the trenches with him—even in different time-zones and with me simply supplying encouraging e-mails and phone calls—made a huge difference in helping him get so much done so fast. And the best thing was, in the midst of all this craziness, we both made a new friend. You can view Stalled Trek: Prelude to Ax’d-We-Are by clicking here.